From Mexico to the Maldives and many countries in between, numerous New Mexico State University faculty members have traveled to dozens of countries as Fulbright Faculty Fellowship award recipients in the last four decades. Through a United States Department of State Bureau of Educational and Cultural Affairs program, NMSU faculty members have participated in an international educational exchange program designed to increase mutual understanding between people of the U.S. and other countries. 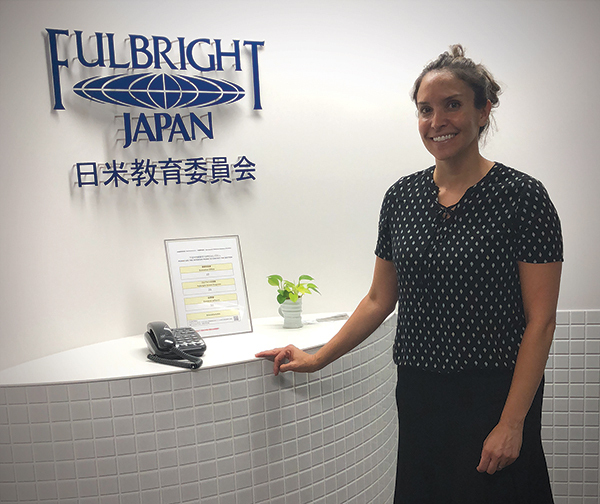 Currently, Jessica Houston, Chemical and Materials Engineering associate professor, is spending the fall semester in Japan at Saitama University in the Graduate School of Science and Engineering after receiving an award of about $43,000. Houston is working alongside Professor Miho Suzuki, a biochemist. The pair has collaborated for several years. “My work involves going into Miho’s laboratory, working with her students, learning about their research projects, writing research papers and planning future collaborative grants and projects,” Houston says. Houston made the trip a family affair with her husband, Kevin Houston, an NMSU chemistry and biochemistry associate professor, and their three children, Joaquin, Kaleb and Kyraluna, who are accompanying her. Jessica Houston is working with Fulbright host Professor Miho Suzuki (front left) and her students. A Fulbright Faculty Fellowship awardee, NMSU Chemical and Materials Engineering Associate Professor Jessica Houston (front right) is spending the fall semester at Saitama University in Japan.